This is an expansion pack for Collateral Damage: The Anime Board Game. Canada has the power of Laser. He can use his Laser or ride his bike, but not both at the same time. Mexico has the power of Mindblast. He has a variable strike, but risks more damage the higher his strike. Kiera has the power to Channel. She can borrow another character’s power. 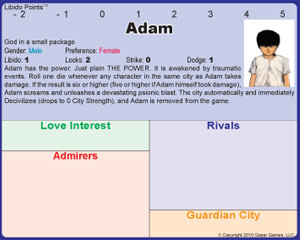 Adam has the power. Too much damage and he explodes, destroying a city. Next Next post: The Toy Man awards Zombie Ninja Pirates!